As of this past weekend, I’m 3 weeks removed from a hiking trip I took to the White Mountains of New Hampshire with a friend to do the “Presidential Traverse,” a 23 mile hike with over 9,000 feet of elevation gain. This is the 4th year my friend and I have taken such a trip. Year 1 was Iceland (The Laugavegur), Year 2 was Glacier National Park, Year 3 was Pictured Rocks National Park in upper Michigan, and this year was the Whites. In Iceland, and this year, we found several people with the same itinerary as us: same trails and staying in the same huts in the evenings, so we got to have conversations with others beyond the typical “Heys” as we crossed paths with others out on the trail. One conversation in particular I had at the Mizpah hut on the second night has stuck with, and inspired me. 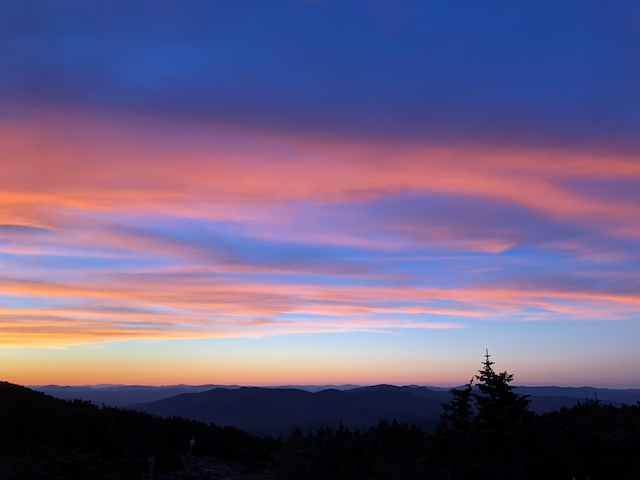 A woman who works on the East Coast for one of the largest tax and consulting firms, said she regularly comes to the White Mountains to “get away and reset.” I assumed she meant “reset” as most people do: reset from the daily chores of life, the grind of work, etc. But instead, her meaning of “reset” was broader: a reset for her value system. By purposely putting herself in challenging situations: a multi-day grueling hike with repeated elevation gains for example(! ), she finds her appreciation for both objects and comforts are almost immediately transformed. The mediocre instant coffee at the end of a 12 mile day at the Appalachian hut? Hits the spot no $5 small batch pour over in the city ever can. The night of sleep on a thin plastic mattress? Like the dead. The basic salad of greens and carrots and radishes at dinner? She’ll have thirds please. Living in a city, we’ve both engineered our environment to be as devoid from the “wild” as possible, and with technology, continue to remove any level of inconvenience or effort from any situation we may find ourselves in. Life’s “creature comforts” long ago became things we take for granted as part of modern society, but are we now taking that dangerously too far where we’re losing our ability to appreciate anything? I personally find the farther away I get from these annual trips, the higher my trend line increases on anxiety, impatience, and complacency. I don’t think I’ll start running ultramarathons, but my new hiking friend’s perspective was a welcome reminder that the answer to keeping those trend lines at bay may not be always striving for more comfort, but for more challenge and sacrifice. See you on the trails next year.